By Viv Forbes - posted Thursday, 6 March 2014 Sign Up for free e-mail updates! Every day some place in the world has "wild weather". And in recent times, human industry gets the blame. 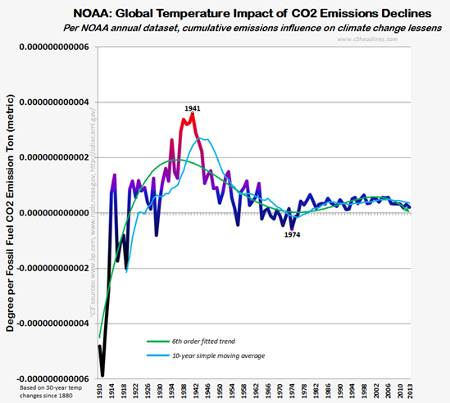 "It's all caused by man-made global warming" (generally shortened to "global warming", or GW by alarmists). If all of this were true, then carbon dioxide is surely the most powerful and disruptive gas on the planet. That great scientist, John Kerry, even calls it a "weapon of mass destruction". 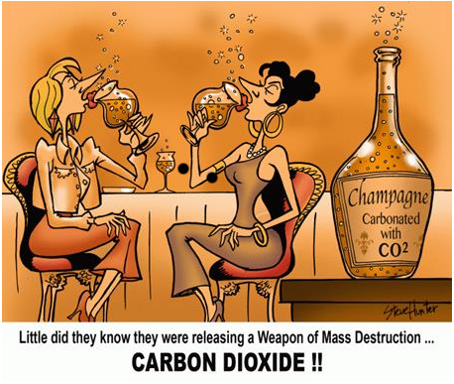 But carbon dioxide (CO2) is one of the most stable, predictable, unreactive and puny of all climate factors. And its effect diminishes for each addition of CO2 to the atmosphere. Adding more now has almost zero effect on temperature. This graph shows that the apparent effect of man's production of carbon dioxide has declined dramatically since 1941, and it is now insignificant. Weather is ruled by solar heating, winds, clouds, pressure zones, temperature distribution, moisture content, lunar phases, sun spots, solar cycles, local topography and the massive moving oceans. A meteorologist never checks today's CO2 level before he prepares a weather forecast for the next few days. Sailors and farmers watch the clouds, the wind and the moon, and have barometers, thermometers and hygrometers – none think about CO2 levels. Rising CO2 in the atmosphere has only one proven effect – it encourages the growth of green plants. Forests, desert plants, crops, orchards, grasses and weeds are all growing better. None of this can cause wild weather. We are told that rising CO2 will cause runaway global warming. This has never occurred in the past with much higher levels of CO2. The evidence shows that temperature cycles come and go, sometimes in phase with today's gently rising CO2 sometimes totally out of phase.